This article first appeared in Enterprise, The Edge Malaysia Weekly, on November 13, 2017 - November 19, 2017. One of the biggest headaches for event organisers is securing a good location, whether it is for a wedding or a company dinner. You have to find a suitable venue at an affordable price and book early enough before the venue is taken by others. Vincent Kok, an entrepreneur who has been hired to run multiple start-ups, understands this struggle personally because of his experience running a travel booking company. “We could help you book a hotel room in London, for example, but when it came to organising our own events, we couldn’t book a meeting room in a hotel online. We had to call or fax,” he says. Booking was just one part of the process. He also had to figure out if the venue was available at the time he wanted, how many people it could fit, whether parking was available and if the venue operators would allow them to bring their own liquor. 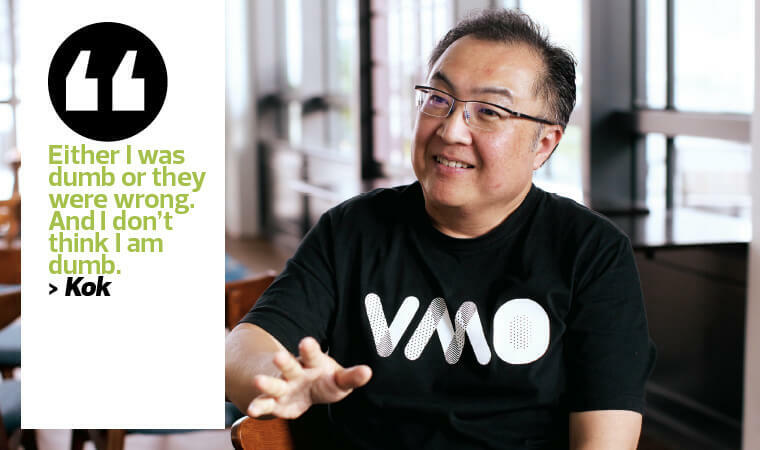 The experience led Kok to set up a company in 2014 called VMO (pronounced vee-mo), which serves as an online venue booking platform. Users can visit the website, www.vmo.rocks, browse for different venues and make a reservation online immediately. The venues listed on the website range from cosy cafés to premier wedding spaces and grand ballrooms. While it may seem like an obvious idea in an age where platforms such as Airbnb and Booking.com are common, Kok had trouble convincing the various key players to get on board. “It was slow going in the beginning. When we started, the first person I met in Singapore told me that it was the dumbest idea he had ever heard,” Kok recalls. Others were just as polite. But Kok has the tenacity of a bulldog. The rejections only spurred him on. He knew he was on to a good thing. He just had to make a few tweaks to his original vision. “Either I was dumb or they were wrong. And I don’t think I am dumb,” he laughs. And so it began. “We thought that hotels would love the idea, but they have a habit of saying, ‘That is a good idea. We will think about it’, when what they mean is no,” says Kok. Restaurants were no different. “So, we decided we were just going to list them first, for free. If they did not like being listed, they could tell us to take it down,” he says. The number of venues listed gradually increased and people began using these listings to find venues and call them to inquire about bookings. Seven months later, in May 2015, there was enough interest for Kok and his team to start charging for listing. “We have more than 1,000 listings now and we grow by two a day. There is always something new,” he says. Browsing VMO is still free, but it charges a 10% fee for successful bookings. Having proven the demand, Kok has been able to secure funding to fuel the company’s expansion. In May, it raised RM500,000 via equity crowdfunding platform CrowdPlus.asia and through a co-investment deal with Cradle Fund Sdn Bhd. VMO is now the leader in Malaysia in terms of the number of listings online, says Kok. This is what sets it apart from its competitors. The demand for new venues will only increase in the future because the new generation of Malaysians are always on the lookout for new experiences, he points out. “The younger generation is such that they do not organise an event in the same place twice. If you have your birthday party at a certain place, for instance, your friend may not want to have hers there as well,” says Kok. The types of venues that it offers are geared to serve evolving demands. In the past, many would book hotels for their events or weddings, but tastes have changed. That is why VMO features more unique locations for events such as premium bungalows. “One of the reasons restaurants continue to choose us is that there is a trend of moving events out of hotels. It is also because of the cost. Customers want to get married on a yacht, for example. So, the hotels turning us down in the beginning has turned out to be a blessing in disguise because we did not concentrate too much on them from the outset,” says Kok. Over 40% of VMO’s business comes from wedding-related events. Kok observes that more people will begin organising their own events instead of hiring event planners. This will benefit the company as it offers convenience and a range of options to potential customers. “Those with a budget of more than RM100,000 may hire professional event planners. But if you wanted to book a company dinner, for instance, you don’t need an event planner. You just need a place to eat, a musician and an emcee,” he says. Anticipating this trend, VMO plans to increase the services it offers to include things such as photography services, catering, magicians, musicians and even event planners. The charge will be 10% for every successful transaction. In October, four service platforms signed on with VMO to provide some of the add-on services. This includes Loanstreet, which will provide loan or advisory services for financing events; FeedMyGuest, a catering marketplace; Boozeat, a wine and liquor provider; and The Picture Team, which has a pool of professional photographers and videographers. “This year, we are expected to do 2.8 million bookings, which means our revenue will be about RM280,000. Next year, our target revenue is almost five times that, which means we will need to do 14 million bookings,” says Kok, who plans to increase the number of listings in the Klang Valley, Penang, Ipoh, Melaka and Johor Baru to 1,500 establishments. The average value of bookings made on the site since VMO was launched until September this year is RM5,900, from RM4,900 last December. Business has been good for this year. Gross bookings at end-September exceeded those of last year and 2015 combined. The company is embarking on its second round of fundraising in November and hopes to raise between RM500,000 and RM1 million. The funds will be used for expansion as well as building a mobile app. “Malaysia has a lot of room for expansion. It has more than 30,000 food and beverage outlets. If you take your McDonald’s and OldTown out of the picture, you still have about 20,000 outlets left. So, we are just scratching the surface. We are travelling from city to city and have just hit over 100 listings in Johor. Sabah is next and then Melaka,” says Kok. The first international location VMO may go to is Mongolia, an unusual first choice for a Malaysian start-up, but Kok says he has a contact who has a business there and is eager to get technology companies such as VMO into the country. “He has people on the ground and he knows quite a number of F&B operators there. So, he is actually going to fund the Mongolian expansion,” he says. “The capital of Mongolia has two million people and Mongolians party every night. If you think that our establishments close late at midnight, their establishments close at 4am. Kok has his eye on other international locations such as Thailand, which he calls the hospitality capital of Southeast Asia. Expanding to Singapore may pose a challenge because a competitor, Venuerific, is already there. “My approach in Singapore will actually be through Johor. So, it will be getting Singaporeans to do their events in Johor and Melaka rather than trying to get into Singapore,” he says, adding that this would work to their advantage as it may be cheaper for them to do events in Malaysia.